For the past few months we worked in a new collective DATACTIVE publication: Data for the Social Good: Toward a data-activist research agenda. It will be one of the chapters in the forthcoming Good Data book, edited by Angela Daly, Kate Devitt and Monique Mann, and published by the Institute of Network Cultures in Amsterdam within their “Theory on Demand” series. Our text builds upon the Data for the Social Good two-day focused encounter we organised in November 2017 (read the report here). During the first day of that event last year we discussed with Charlotte Ryan, Lorenzo Pezanni, Jeff Deutsch and Nico Para about the ways in which research and activism intersect in projects which rely on data. On the second day, we were joined by a diverse group of researchers and activists for a workshop exploring what a data-activist agenda would look like (seriously, read the report here!). In Data for the Social Good: Toward a data-activist research agenda, we took that conversation and expanded it two fronts. First, we grounded theoretically our take on what it means to be a (data) activist, which implied clarifying what data activism means in the first place, as well as briefly revising the origin and evolution of engaged research. Secondly, we reflected more deeply upon the ethics of collaborative investigations, paying particular attention to the power relations between the actors involved throughout the process. 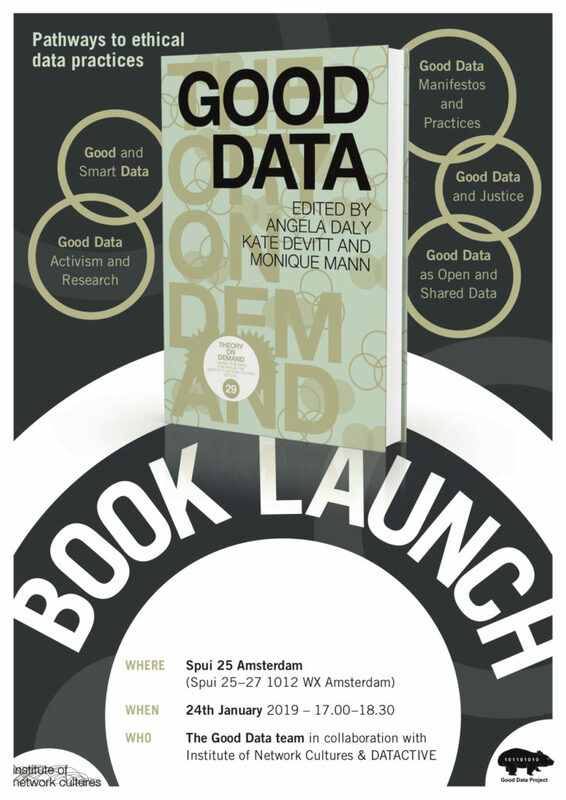 The Good Data book will be launched in Amsterdam at 5pm of the 24th of January, at the cultural centre Spui25. It includes 20 different chapters exploring what good data practices are, from manifestos to smart city reflections (and nope, not a single reference to blockchain). Both the editors and DATACTIVE will be around to discuss more about how to use data for good rather than evil, so join us if you’re interested in knowing more (or getting the book)!